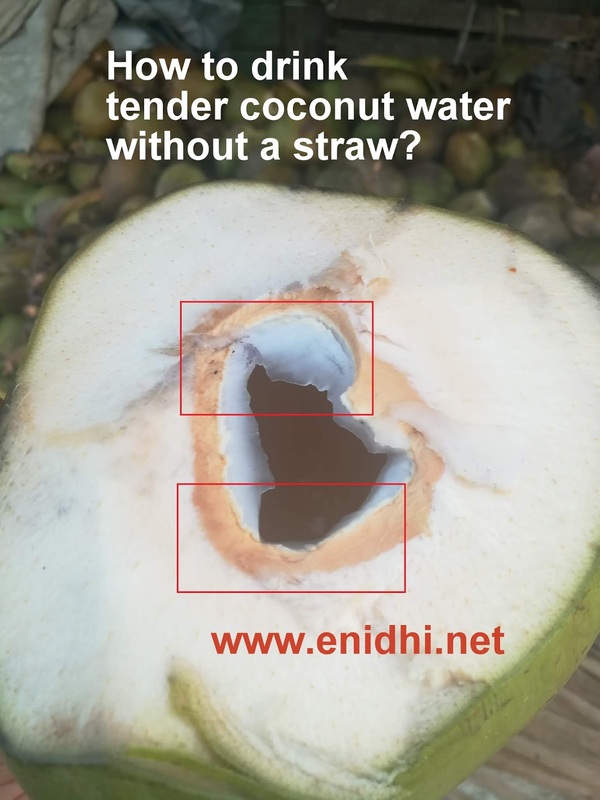 Home / Unlabelled / How to drink tender coconut water without using straw? 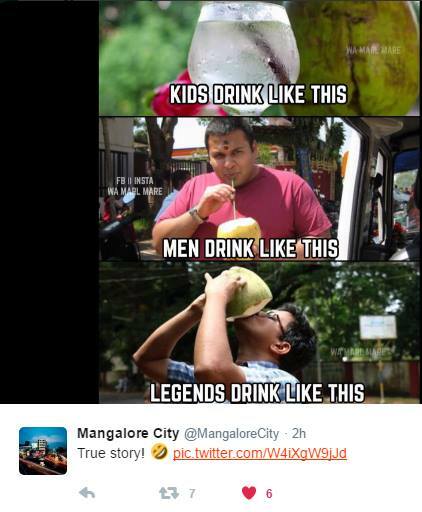 All of us drink juices and drink tender coconut. 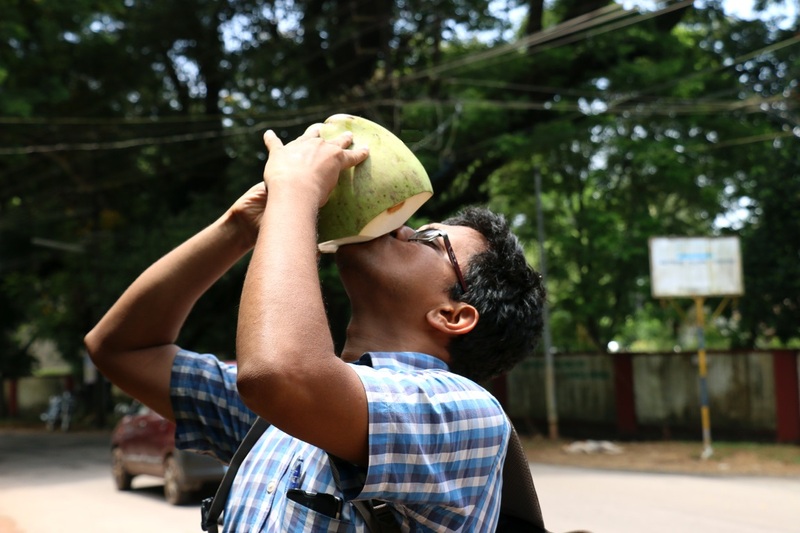 Though the juices and tender coconut is natural, most of us use a straw to drink. Even without asking vendors by default insert a straw and serve. Some of us find it more hygiene and convenient to drink through the straw than drink directly from the juice glass. 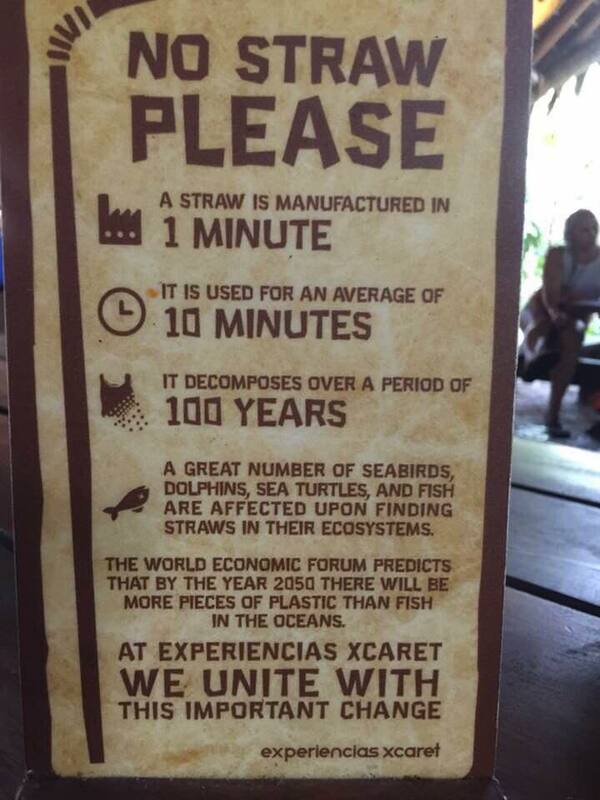 Of late many activists are launching campaigns to save the straw- rather to encourage people NOT to use the straw. Though it is a small n simple object, millions of them are used every day in cities, all of them are non bio-degradable and end up becoming a plastic waste. If most of us can avoid the straw and drink direct, it will be that much less burden for mother earth. Avoiding straw on a glass of juice is easy-one can drink directly from the glass. But how to drink tender coconut without a straw? Won't it spill all over your face? That is the focus of this post- I will make an attempt to explain how to drink tender coconut water without a straw. Try it out- on first few attempts you may end up spilling some water on you, but soon you will perfect this art and will begin to enjoy drinking tender coconut without a straw. Step 1: Ask the vendor to make a slightly larger hole/opening. An opening of the size shown below will be ideal, even half this size opening is good enough. Too big an opening (like it is done in Indonesia) is also a problem, as opening will be too large for your mouth and coconut water will overflow. Slowly connect your lips to the identified area in the opening, tilt the coconut a bit so that water flows into your mouth by gravity. If the water spills or the flow is too much you can tilt the coconut back to your original position, recover, correct yourself and retry. This step will take some practice to get used to. I am sure you will perfect it soon within one or two attempts. That's all- you've now saved one full straw. If everyone in the city does the same, it is thousands of saved straws each day, millions per month across the nation- several tons of plastic saved from being pushed to garbage system and then to ground. One big clap for yourself, for the tiny but significant change you've embraced. A normal tender coconut will have more water than you can fill in your mouth. So it will be good if you learn to pass the water down your neck while the pouring is in progress. This practice you can do with a bottle of water as well- can you drink a litre of water non stop? Then you won't have any issue emptying entire coconut in one go. If not you will have to pause a bit, drink what's in your mouth and repeat the process. If you can't drink tender coconut direct, an alternate way is to pour it to a glass or a bowl first and then drink from the glass/bowl. Just for fun: Someone made a meme last year with my photo-take a look! 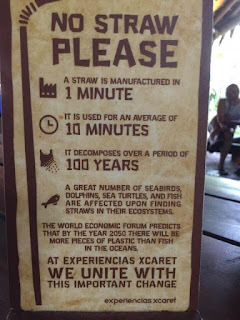 Economic times report- in US and UK combined, 550 million plastic straws are disposed every single day. The taste of tender coconut water can be enjoyed better by drinking straight, rather than using a straw. For that matter, any cool drink. 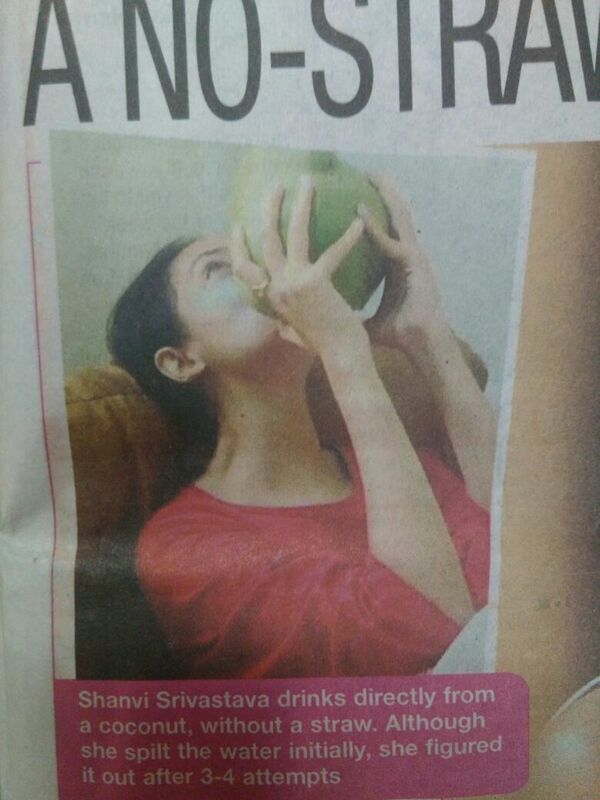 I also sip the water sucking air in, as I drink straight from the tender coconut so that spilling or overflowing from the sides can be avoided, thus keeping our dress intact. Tender coconut water tends to stain the clothes. So also avoid using the hanky immediately after drinking the water. I ask the coconut vendor where he keeps a bucket with water, so that I can rinse my hands before using the hanky. Thanks for the detailed comment. I didn't think about the stain part.. The strain has always been my doubt too in drinking that way. I usually carry a big bottle with a mouth that can have the water emptied inside. I take 2 tender coconuts at a time. That way, I can have it slowly, rather than quickly have it. Thanks for bringing up this topic. Plastic waste by straws is destroying the planet. Vendors give straws/polythene to customers by default and people are unaware of the slow destruction they are causing. I refrain from using/accepting these consciously. Metal straws are available easily online- http://steelstraws.inOne , https://amzn.to/2s4HURv . Small efforts can be a huge step for the planet. I loved this article champ. May there be more people ditching the straw when it comes to drinking tender coconut.